This edition of Harp Weekly used to be a draft. I wrote about how you can create draft posts for your static blog, too. Of course, it’s not a draft any longer, which means there’s more Harp links from this past week worth checking out. In a decision that dramatically altered my sleep schedule for the remainder of the week, I decided to turn Ghost’s default theme into a boilerplate for Harp. This means you can now run Casper with no backend. I’ve done my best to have it match the features currently available in Ghost. For example, you can create pages or posts, add custom header images, and modify the templates with EJS and the styles using Sass. This boilerplate is a fork of the MIT Licensed Casper; the the source code for the Harp version is available on GitHub here. The Harp Platform, which allows you to publish static sites and client-side apps through Dropbox, introduced the Build URL feature, which allows you to see a previously published version of your site, served by Harp. Find out more on the Harp Platform blog. Jon Abrams is working on Synth, a web framework for synthesizing API-first web apps that also have web front-ends. It uses Harp for its preprocessing. Read more about it—appropriately—in the project’s README. Rob Ellis wrote about moving his personal projects over to Harp. If you’ve got a handful of projects with outdated codebases, it might be just the motivation you need to make them static. After a request on GitHub, the Harp boilerplates Baseline and Remedy both had next and previous post links added. Take a look at the quick examples of how to add them; a more comprehensive recipe is coming soon. 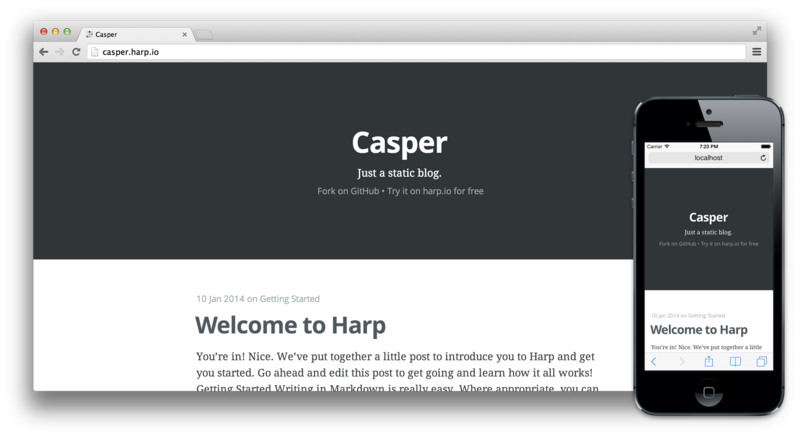 Next Harp Weekly will help you get ready for Static Showdown, a 48 hour competition for creating static web apps. Harp would be the perfect tool to help with your entry. Until then, follow @HarpWebServer on Twitter for the latest.